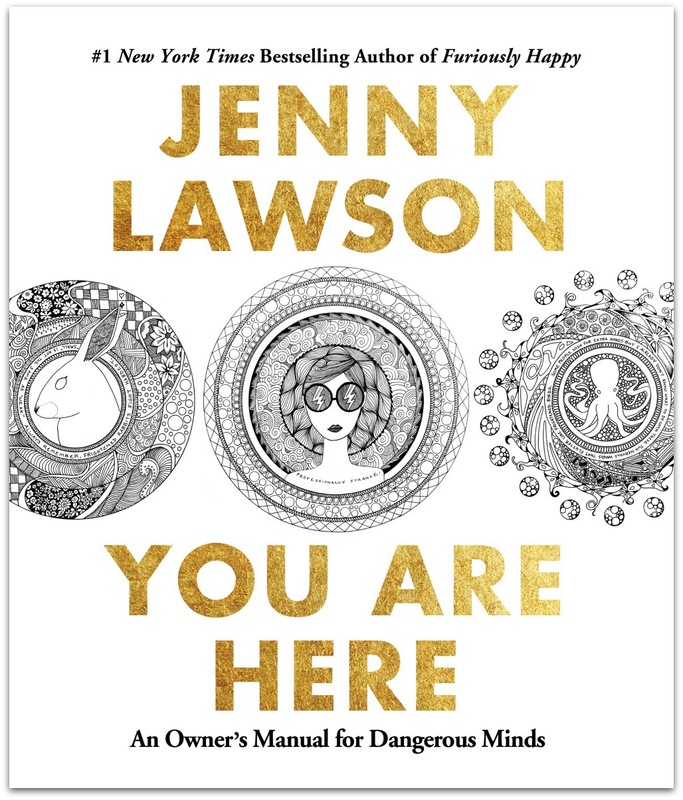 Today I received my copy of “You Are Here – An Owners Manual for Dangerous Minds” by Jenny Lawson. And I am going to do my best to put words to just how much this book means to me, and why. The last few months of 2015 were filled with overwhelming depression and anxiety for me. More and more frequently I was spending sleepless nights locked in the bathroom cutting in an attempt to get everything out. When the depression was at it’s worst moments I was no longer capable of feeling the cuts so began to burn myself as well. By December of 2015 my therapist had finally convinced me to open up to my husband who was not yet aware of my behavior. He and my therapist together convinced me to go to the hospital while my meds get readjusted in an effort to keep me safe from myself. The first couple of days in the hospital I was silent, unable to open up to anyone. I was also having extreme panic attacks consistently. By day 3 I was found hiding in the corner of my room under a desk, scratching at the half healed cuts on my arm to make them bleed. I was told to sit in front of the nurses station for a while to ensure my safety. While there a nurse gave me a stack of coloring pages and some colored pencils and encouraged me to color to get my mind off the anxiety. I found a page I liked and started to color. And I didn’t stop. For the remaining days in the hospital I colored. I talked to other patients and began to open up, but did so while I colored. I sat in group therapy and participated, all while still coloring. I ate my meals with my coloring page next to me, choosing carefully my next colors to use. I woke up from nightmares in the middle of the night, went to the common room and colored until I could fall back asleep. I colored so much my hands were covered in blisters and my fingers were cramping. But the pain in my hands could never compare to the invisible pain that lives in my mind. So I ignored the blisters and cramps and I colored. When I got home I struggled to adjust, so I continued to color. When I relapse and begin to cut again, I pull out my colored pencils and colored. It keeps me safe, sometimes I think it keeps me alive during my worst times. Through the creation of this book, Jenny Lawson has given the world beauty and hope. She has helped minds like mine find an escape. But for me, the most special gift in this book is safety. Jenny Lawson has given me hundreds of nights where I can keep my hands busy with a pencil instead of a knife. And for that I am beyond grateful. Thank you Jenny, and please never stop bringing your beauty into the world. Never stop being you, because minds like mine need you.